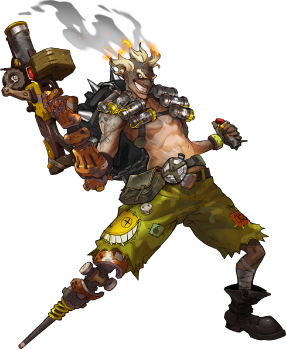 Junkrat is a really strong character versus the right heroes, He can also be very weak versus effective Junkrat Hero Counters that take advantage of his weaknesses. Since the general strategy for Junkrat is to hang back and Spray-N-Pray. Characters who have long range damage tend to be Strong Junkrat Counters, Junkrat Hero Counters like Pharah and Widowmaker can easily deal with a junkrat. Junkrat’s biggest weakness is not only that he lacks long range damage, but also the ability to deal in air enemies. This is why Pharah is possibly the best Junkrat Counter available in Overwatch. While Junkrat can do tons of damage with his Frag Launcher, it takes a lot of experience and practice to accurately land grenades. A best practice with junkrat, is to launch your grenades at a general area, rather than directly at a moving target, as Junkrat’s biggest strength comes from his ability to make any area hazardous to travel through. If you are attacked by an enemy up close, you should use either your Concussion Mine or Steel Trap to gain the distance needed, since firing grenades up close is just as likely to kill you as your enemy. Junkrat’s tire can pick up health. If you explode it in mid-air it does less damage than if it were on the ground. His traps can steal health packs if you place them on the health pack and it gets damaged. Pharah: Has a huge advantage over junkrat since he has no direct way to deal with airborne enemy’s aside from his Concussive mine. Pharah is among the best Junkrat Counters for this reason alone. Widowmaker: Junkrat has another weakness, he lacks the ability to deal with long range damage dealing heroes. Hanzo and Widowmaker both have these qualities, making the some of the best junkrat counters.